Phillip R. Polefrone is a PhD candidate at Columbia University’s Department of English and Comparative Literature and Architecture Writing Fellow at the Cooper Union’s Center for Writing whose work focuses on the intersections of American fiction and ecological science from the twentieth century to the present. His dissertation (in progress), “Literary Naturalism and the Anthropocene,” traces the intersections of American literary naturalism and early ecology, arguing that the genre’s unrecognized environmental ethos anticipates contemporary theories of a geological epoch defined by human activity. 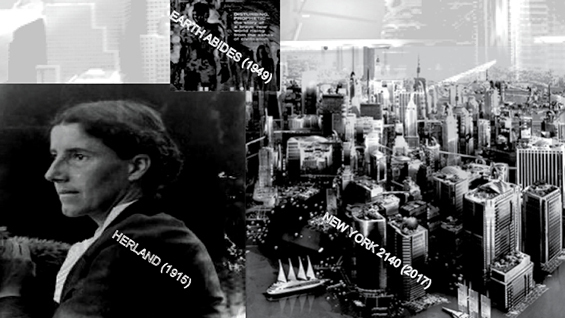 This lecture will present a triptych of speculative fiction novels spread over roughly a century, each using representations of architecture to address the challenges of its ecological moment. Charlotte Perkins Gilman’s Herland (1915) creates a utopian space that unites socialist, feminist, and environmental reform in the face of population pressures and concerns about soil health. George R. Stewart’s Earth Abides (1949) measures the magnitude of humanity’s planetary influence through the durability of physical infrastructure. Finally, Kim Stanley Robinson’s New York 2140 (2017) imagines possible modes of architectural and social resilience in the face of climate change, asking what urban space and culture would look like after fifty feet of sea level rise.